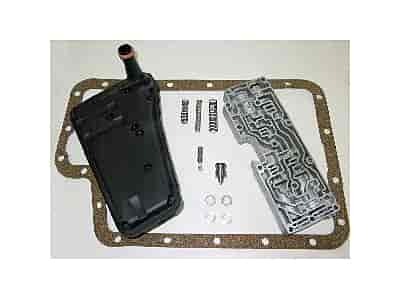 The Ford Accumulator Kits come complete with a Filter and Gasket for a quick no hassle installation. Don't Forget to add Transmission Fluid to your cart! Note: Price includes core charge. BD Diesel Performance Exchange Accumulator Kits can be installed in the stock transmission by reducing the time that it takes to shift from one gear to the next. A long delayed shift may be smooth but it drags the clutches which causes heat and premature clutch wear. The rate and the volume of the apply oil is modified with the components included in the exchange accumulators. The bodies mating surfaces are lapped to prevent any cross leaks. A new pan gasket and filter is included to make this a smart and clean transmission upgrade. Designed for E4OD and 4R100 transmissions that are driven by diesel engines. Quicker shifts reduce heat and result in less clutch wear. Does BD Diesel 1060442 fit your vehicle?